"My son absolutely loved the one-to-one sewing session and the instructor and is very proud of the cushion he made. Thank you." 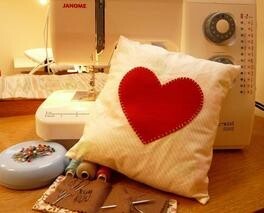 Private sewing classes and birthday party classes for up to 20 children aged 5-12. Private kids classes booking, content and pricing info here. Attend any of our weekly 'Stitch' sewing & dressmaking classes - Children between the ages of 7-12 can attend our adult classes when accompanied by an adult (who doesn't pay or sew their own project) as their helper. Find out more about Stitch Classes. If your child is age 13 or over they are welcome unattended to any of our Stitch Classes or one-to-one sewing lessons, as well as selected sewing courses and workshops (see individual course/workshop page for age restrictions in the 'experience' section). © Copyright Sew In Brighton 2019. All Rights Reserved.